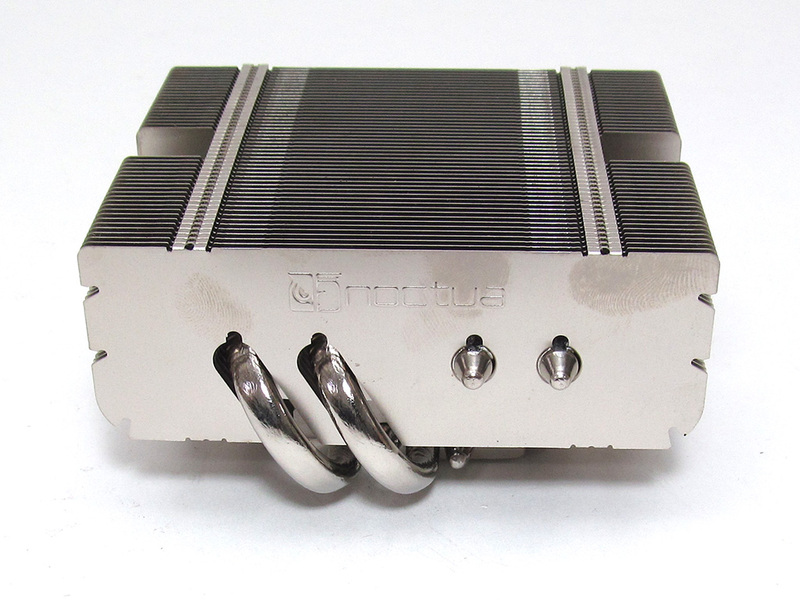 Noctua’s NH-L9x65 is basically a small 92 mm square heatsink with forty-nine aluminum fins. These fins are bare aluminum and are, as such, a fingerprint magnet, as you can see in these images. For those wondering, this tiny heatsinks is only slightly larger around than the Intel stock cooler; however, it is a bit taller (65 mm instead of 45 mm). The fin design is pretty simplistic. There are no crazy designs or any new tech—this is just a heatsink of solid quality without any crazy design elements. The four Ø6 mm heatpipes alternate as two sets of two to help evenly distribute the heat among the aluminum fins. Noctua used soldered joints and nickel-plating, which is the norm for them. The base is out of common-fare nickel-plated copper, and while somewhat reflective, does not have a mirror finish. Although it won’t impact performance, It is very easy to see the base’s milling marks.The four Ø6 mm heatpipes alternate as two sets of two to help evenly distribute the heat among the aluminum fins. Noctua used soldered joints and nickel-plating, which is the norm for them. The base is out of common-fare nickel-plated copper, and while somewhat reflective, does not have a mirror finish. Although it won’t impact performance, It is very easy to see the base’s milling marks. The fan Noctua provides for the NH-L9x65 has the model number NF-A9x14 PWM and uses an SSO2 bearing. Its RPM range is 600-2500, and it peaks at 1800 RPM with Noctua’s low-noise adapter. While the fan may be rather small and thin, it still utilizes ridges on its fan blades and frame to improve airflow. Let us not forget Noctua’s very special reddish brown and beige color theme I find ugly, but hey, it is their calling card.